Llegando apenas a esta maravilla de máquina. Muy contento con ella. Thanks for your input Louis, we all appreciate the insight of a brand troll. If you did even purchase a 50D (as opposed to say just browsing through other peoples images for assessment) and received a defective model in some way that is not an verdict of the manufacturer nor model. Nikon has produced some lemons as well, not to mention an equal number of owners with defective hardware. As you supposedly sent the camera into Canon three times and were still unable to take 'sharp' photos, it is more probable that someone used cheap lenses and/or poor technique. There is no inherent softness of the 50D, however just like every higher mp camera that comes out people are slow to admit that the lenses they have been using and their technique are just not up to the task. Even some of Canon's earlier 'L' glass prior to the 50D was not capable of resolving this sensor. Just for reference, the 15mp APS-C sensor in this body has the same pixel density as a ~37.5mp full frame sensor - something Canon/Nikon/Sony/etc has yet to even produce. So to say that there are a some Canon lenses unable to produce 'sharp' images on the 50D would be a gross understatement. If you feel your Nikon D70 is a better camera, great! Go have fun taking your backyard snapshots. All I can say is that I am very pleased with this camera. I actually bought it through the Canon Loyalty Program. I traded in my old, broken 10D (wore out the shutter years ago) for a refurbished 50D at a pretty low price. I got this as an upgrade from my eos 350d and I love this camera, it was well worth the money. I've read in some reviews about users who complain about the camera not having video or being an equivalent of the Canon EOS Rebel T1i but cost more. The Rebel T1i is basically a starter dslr packed with a lot of features...the 50d is a prosumer dslr which is aimed at advanced photographers who want to experience an almost pro camera without breaking the bank. 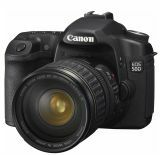 The 50d is more expensive because it has features that a starter dslr doesn't have. Features such as a faster maximum shutter speed, faster frames per second burst, more raw file format type saving, a magnesium alloy body, a pc sync terminal and more. It also has a bulkier feel to it when holding it which a lot of photographers prefer than the smaller starter dslrs. The pc sync terminal is perfect when working in a studio. I don't really mind it not having video at all. If I wanted video, I would buy a video camera instead of a dslr which I think would have a better video quality in the first place. All in all it was a thousand dollars well worth it! One of the best cameras I have ever owned. Period. Very low image noise, even at 6400/12800, and the detail is incredible. Hats off to Canon for leading the way as always! Well the 500D has been released and it has Movie mode and bascially everything the 50D offers.... Is it as good as the 50D and therefore better values for your dollar??? Maybe I should have waited for its release. Just coming back from my frist trip with my new 50D. Even if I only had the kit lens (17-85 f/4-5.6 IS USM) I must admit that I'm preetty impressed with the overall quality of the output. The camera itself is really great to use... Planning to add the grip and a few "L" lenses. "Are shots at say ISO 6400 in poor light printable"? That depends on the size of the print, you preferenses for image quality, and to some degree your shooting technique. As mentioned below, if you use a positive exposure compensation and then pull it back during postprosessing you will reduce noise and improve tonality in both shadows and midtones. When you have dialed inn a "perfect" exposure according to the histogram on your camera, then dial inn a +1/3 or +2/3 exposure compensation. Don´t worry about blowing the highlights, there is about 1EV available headroom for highlights in RAW files. Pull back the exposure slider -1/3 or -2/3 during postprosessing. You will see that the tonality improves and the noise will be hidden. This is a technique you can use at every iso setting. Will ISO 6400 give you a good print? I don´t know, because the size of the print and your preferences for image quality are variables only you know. "fine for web" is maybe true, but that's not what i'm aiming for... Are shots at say ISO 6400 in poor light printable.. If so, then it's a definite value for money. It has been a lot of talk about iso noise. I think the 50D is doing great at high iso values. Look at photos taken by pbaser Tornado Alleyhttp://www.pbase.com/tornadoalleyhoops/image/104986577 Most of them taken at max iso, 12800 and under poor lightning. They are fine for web. To further improve images taken at high iso settings dial in an overexposure (+1/3 or +2/3) and pull it back during postprosessing. It will help a lot to reduce the noise. Watch the histogram and "Shoot to the right", as they say. I read negative things on Dynamic range, and on "real usabillity" of high ISO's. I shot this gallery -http://www.pbase.com/philkneen/on_a_friday with my new 50D and 17-40 f4L. I bought the 50D as a back-up camera for my 5D,however I am so impressed with it that it's become my principal camera now. Some reviews of the 50D have not been too impressed with it's high ISO performance compared with the Nikon D300/D90 which use a smaller MP count. What does the forum think? Off to test, will publish this weekend! Looks like the camera I've been waiting for. Now it's just time to wait and see if it lives up to the hype. Wish Canon had sent a few actual production cameras out for review prior to release. Good news is I hear Oct. 6th they hit the shelves. As for movie mode, that's what p&s cameras are for. Hurrah for no movie mode! Spend the r&d budget on improving stills. Waiting for a good review, esp.. at high ISO readings. Has digic 4 improved the AF again as did digic 3? I was happy to see the announcement for the 50D, it was just the camera I was looking for. Short after came the announcement for the 5D mark II - will there be a significant different in quality between these to cameras? I can see more pixels and weather sealing, and of course the opportunity to take HD videos. Most of my lenses is for "C" sensor and I also had to consider that I had to invest i a few new lenses. (my camera today eos 400.